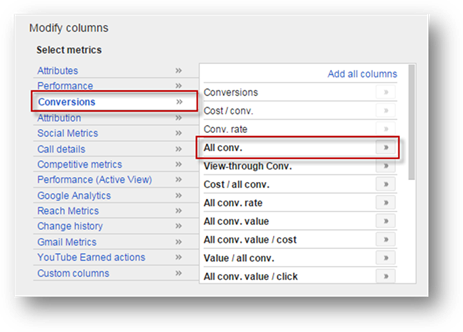 Conversion tracking needs to be setup to see conversion data in AdWords. Referred to as = All Conv. This can provide a more detailed view but is only generally applicable for certain accounts where these additional conversions are either tracked or important. ‘Conversions’ differ from ‘All Conversions’ in that they do not include the above list of conversion types. So if you are tracking these, you will need to use the ‘All Conversions’ metric to see all of your relevant conversion data. ‘All Conversions’ essentially equate to the collective purchases (conversions) of all customers / users; whereas a converted click is basically a unique customer. A good analogy of this would be a customer in a supermarket that buys 4 bananas... This would be the equivalent of 4 ‘All Conversions’ but only 1 converted click. To use an example in AdWords; if we imagine a campaign that received 40 Conversions, 5 phone calls and 300 Clicks, but it is the case that all 40 of those conversions came from just 30 Clicks (ignoring phone conversions) ... we would have 45 ‘All Conversions’, 40 conversions and just 30 Converted Clicks. Consequently, this metric is used a lot in reporting. You may also want to segment conversion data by device and network to identify how well each of those components of the account are performing in terms of conversion numbers. Many website owners have multiple conversion types on a site such as; downloads, sales, lead generation, collecting user information, requesting a quote, calling a phone number, etc. Each of these has a different value even if the value is not hard and fast like the value of a phone call... It is typically beneficial to attribute a value to the conversion in AdWords. Having a value allows us to optimise for different goals such as a cost per conversion.